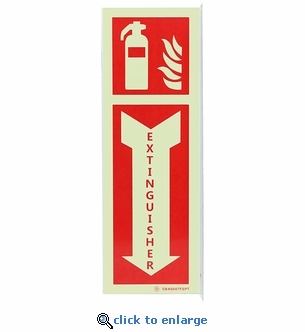 Home > Fire Safety & EMS > Fire Safety Evacuation Supplies & Tools > Fire Extinguisher Arrow Signs > Jalite Photoluminescent Flag Mounted Metal Fire Extinguisher Arrow Sign - 4" x 12"
Home > Fire Safety & EMS > Fire Extinguisher Arrow Signs > Jalite Photoluminescent Flag Mounted Metal Fire Extinguisher Arrow Sign - 4" x 12"
Home > Fire Extinguisher Arrow Signs > Jalite Photoluminescent Flag Mounted Metal Fire Extinguisher Arrow Sign - 4" x 12"
Jalite Photoluminescent Flag Mounted Metal Fire Extinguisher Arrow Sign - 4" x 12"
These two-sided 4" x 12" aluminum flag mounted photoluminescent fire extinguisher arrow signs are energized by ambient light and will illuminate the instant lights go out. These glow in the dark location signs are perfect for corridors and large open areas to ensure your fire extinguishers are easy to locate in the event of a power loss or fire emergency. The photoluminescent material is charged by common light sources such as daylight, tungsten filament and fluorescent lights. One hour of exposure to ambient light source will sufficiently charge the photoluminescent sign to glow brightly for more than 8 hours. Charges with as little as 2 footcandles (fc) of ambient light. Illuminates brightly the instant power fails. Makes your fire equipment is easy to find. Jalite high-performance photoluminescent materials are non-radioactive and non-toxic. Two sided with 3/16" mount holes on two flanges. Complies with local building codes. Graphical symbols designed using ISO 7010/NFPA 70 Standards. Mount Type: Flag, 90 degree to wall. Jalite Photoluminescent Panoramic Metal Fire Extinguisher Arrow Sign - 4" x 12"
Rigid Plastic Fire Extinguisher Arrow Sign - 4" x 12"
90 Degree Fire Extinguisher Arrow Sign - Rigid Plastic - 4" x 12"
Vinyl Self-Adhesive Fire Extinguisher Arrow Sign - 4" x 18"